If you wish for us to match specific Pantone or other color colors, let use know when you submit your design request. We always test print your designs to ensure they match as closely as possible. 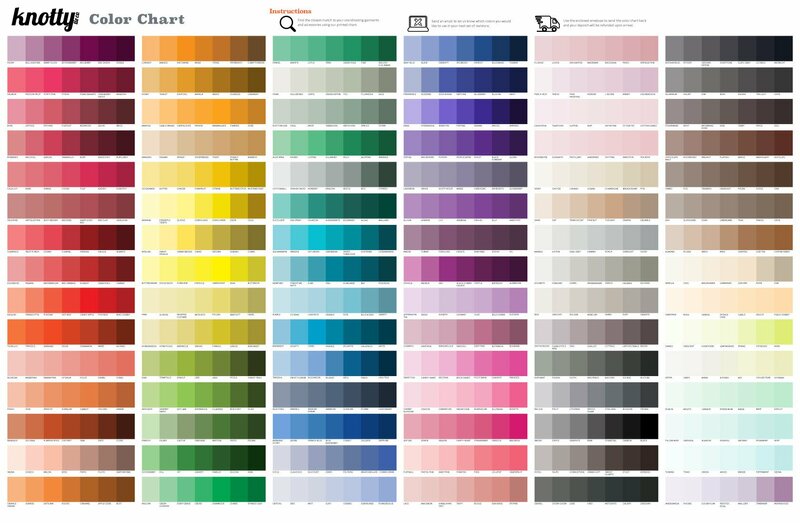 If you have no exact color codes, but still want to ensure the colors that will print are what you want, simply check out our ColorMatch chart. Use our charts to verify and preview colors before you order your products. The Knotty Tie ColorMatch chart is 560 of our standard colors printed onto the same recycled polyester twill used for our ties, bow ties, and pocket squares. Please keep in mind that because of potential differences in screen calibration, print conditions, and the effects of printing onto fabric, there is some natural variation between proof and finished product. What you see on your screen may not be exactly the same as your finished product. The best way to get exactly what you want is to confirm your colors in person by ordering a color match chart.